After having lunch at Paradise Dynasty, we wandered around Orchard in search for an afternoon tea place. I don’t fancy the new Marmalade Pantry at Ion Orchard, the space is too open and you can’t even hold a private conversation there. In any case, it was full (on a weekday afternoon), and so was TWG Tea Salon which had a queue outside. We ended up at Royal Copenhagen Tea Lounge at Takashimaya – and yes, the place was also packed. Don’t people need to work on weekdays? I know it doesn’t make any sense, but who cares? In the name of research to try the best cakes from Royal Copenhagen Tea Lounge, we decided to share four cakes for high tea. Sounds like a plan, no? 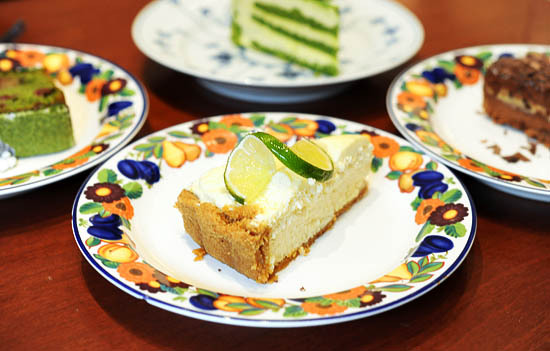 Amongst the ones that we had, my favourite was the Key Lime tart. Both Tai-tai and I had our eyes on it, and the melt-in-your-mouth-tart was gone in an instant. If you go to Royal Copenhagen for afternoon high tea, it is a must to order both the blueberry cheesecake and key lime tart. The layer of caramel ganache in the middle made the difference for the Chocolate Earl Grey Mousse & Caramel Ganache Cake. 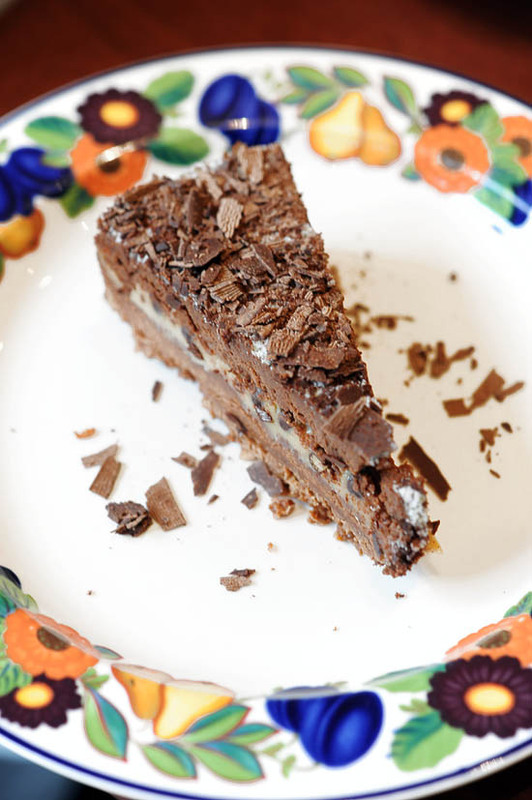 The extremely rich and sweet cake was the right dessert to give us a sugar-high. 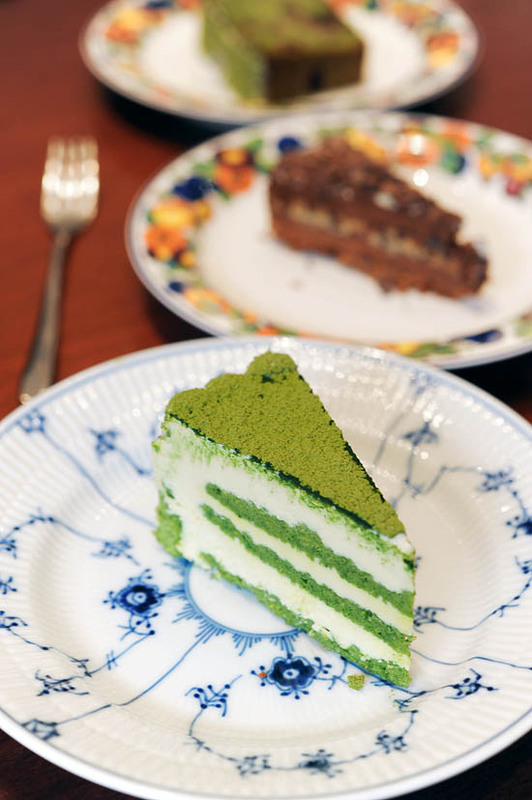 In order to satisfy the Diva’s lust fondness of green desserts, we had Royal Copenhagen’s Matcha Tiramisu and Green Tea & Morello Cherry. It was actually my first time having a green tea rendition of the tiramisu, and thankfully it didn’t disappoint. 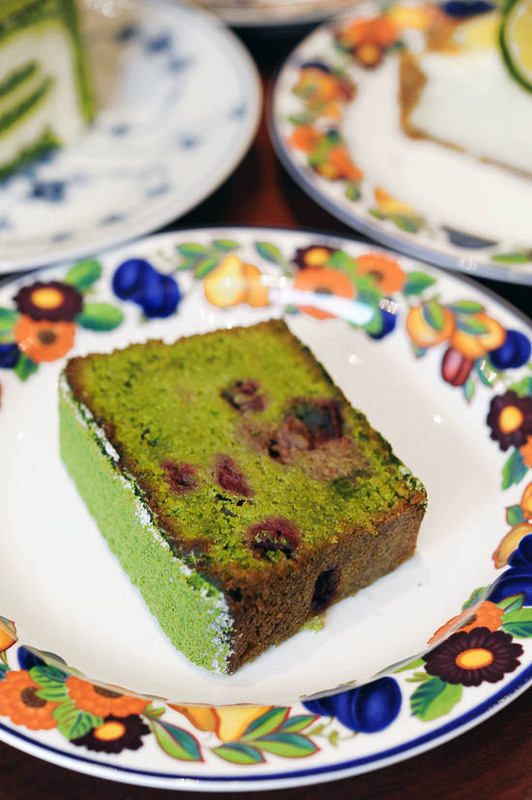 The Green Tea and Morello Cherry Cake was moist and dense, but not too heavy — an ideal snack for a leisure afternoon with a cup of tea. Royal Copenhagen Tea Lounge at Ngee Ann City is narrow and it can get quite noisy when it is crowded during afternoon tea time. But they have lovely cakes (ranging from $5 – $6 per slice) which are more affordable than dessert places like Canele Patisserie. If you prefer somewhere quieter for high tea, go to The Regent Tea Lounge, or Jewel Artisan Chocolate. Interesting concept. Royal Copenhagen sells china and they use it to serve food in their own restaurant. Its like a demo room where customers pay! you should try their danish butter cake. it’s magnificent. ^^ I love their cakes. That chocolate mousse cake looks delicious. I find it interesting that your friend likes green desserts because I’m the opposite – I find green food looks unappealing (maybe because mould is often green?) But I’m sure if I actually tried them, I would enjoy the taste! The place lack maintenance. The tea isn’t that great either. I spent many a good lazy afternoons in Royal C since they first started. It used to be really nice and quiet, but it did get really busy as it got popular. I am saddened by its demise and I can’t possibly accept TWG as a good substitute. It was never pretentious like TWG and it served good sweets at reasonable prices. After Sun Moulin’s demise, this is another sad chapter in our lazy tea time history. Not all of the above plates look as if they are by Royal Copenhagen??? Check their website http://www.royalcopenhagen.com – they dont have any multicoloured plates. The cafe is no longer operating, do you know where has it shifted to ? I love their cakes. Just saw Elaine comment, about the demise. Agree with her, I dun like TWG.. the atmosphere & the lighting is a bit weird..
emily: Royal Copenhagen has closed down for good. i was sad when this place closed down! not only were their desserts good, their main courses were nice too, esp enjoy their open faced sandwiches. it was my go to place for casual lunch and tea with girlfriends and now it’s the pricey twg. sigh.